The classy Yadanarbon offers great rooms and helpful staff, but it suffers the same problem as several newer, upmarket hotels in town: while rooms are excellent and they do have a good rooftop bar, they’re pricing themselves firmly in the midrange while lacking any garden or pool. Ad Book now! Rates from US$39.97++. Average rating 8.3 from 2,240 reviews. The similarly priced Ayarwaddy River View and Mandalay City however do fill up quickly, and if you’re caught out, then the Yadanarbon is a very useful back-up address to have. Their location on 31st Street is convenient for the station, hospital and Diamond Plaza, but a long walk from most of Mandalay’s eating options, though perhaps in compensation the in-house restaurant is one of the better ones around. The hotel exterior is standard Mandalay: a narrow design with spacious ground floor reception, five floors of rooms and a rooftop bar. Beginning in the lobby, decor is very tasteful, with plenty of cane furniture and pot plants and an effort’s been made with the rooms too. All are well sized and have large, spotlessly clean bathrooms. Unusually too, just about all rooms, even on lower floors, have views and are bright and airy. They’re well appointed as you’d expect at these prices, with new air-con units as of 2016, minibar, complimentary tea and coffee, cable TV, safety deposit boxes, and bathtubs. The furniture’s new too and rooms have wardrobes, desk and chairs. The decor is fresh white walls and varnished parquet floors. Standard rooms are on the small size and for up to $75 in high season we wouldn’t bother with these, but deluxe are good and large and can sleep three. The rooftop eating area is one of the best we saw in town and a delightful spot for their buffet breakfast as well as a sundowner, though be warned they do have puppet shows in the evening. 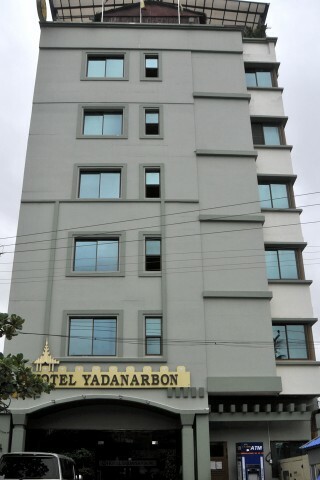 Check rates at Hotel Yadanarbon on Booking.com.